Oct. 24, 2017. Smithsonian Features UO Instructors’ sound and art installation. Oct. 12, 2017. 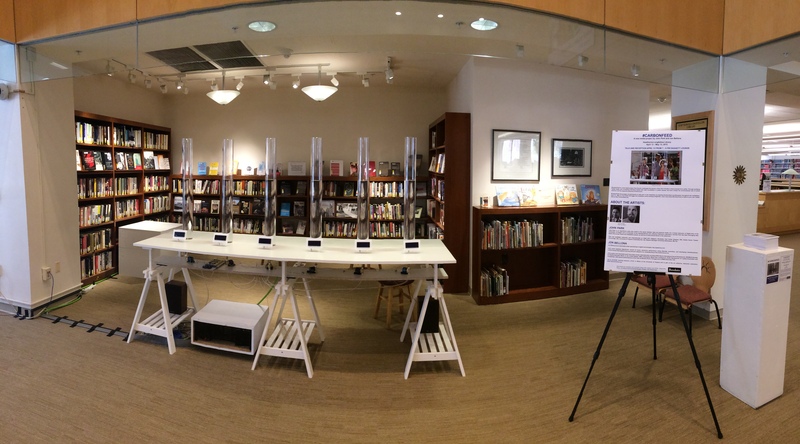 Five UVA Projects on Display at the Smithsonian for ACC Innovation Festival. Sept. 20, 2016. University of Virginia: Intermedia Art Installation. Sept. 15, 2016. Daily News-Record, Harrisonburg, VA. Read the article (pdf). Apr. 23, 2015. Bowdoin College Press. Apr. 17, 2015. Bowdoin Orient. Feb. 09, 2015. University of Virginia: The Musicality of Data. Aug. 29, 2014. University of Virginia: Office of Sustainability. * Part of Harmonic Laboratory’s Recurrent Constructions exhibition. Sept. 5 – Oct. 15, 2016. 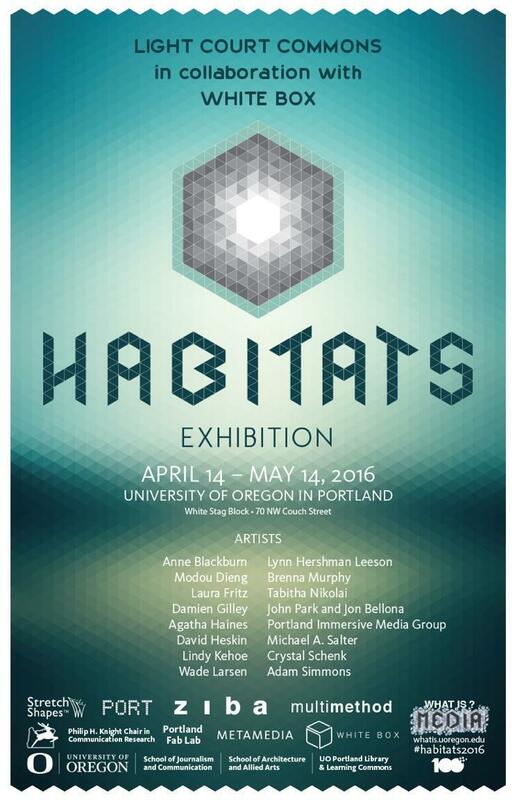 Duke Hall Gallery, James Madison University, Harrisonburg, VA.
* Habitats Exhibition April 14–16, 2016. Portland, OR. * Electro-Acoustic Barn Dance Oct. 3, 2015. University of Mary Washington, Fredericksburg, VA. Adapted for interactive video-work, Carbonfeed was presented as a six minute concert piece. * Bowdoin College Library, Apr. 10 – May 10, 2015. Brunswick, ME. Installed at the library in the main lobby. Over the month, the installation space saw 20,000 visitors. * Society for Electro-Acoustic Music in the US (SEAMUS) Mar. 26-28, 2015. Virginia Tech, Blacksburg, VA. Installed for the SEAMUS music conference at the Moss Arts Center. * Eyewash Festival, Feb. 10, 2015. Dartmouth College. Adapted for interactive video-work, Carbonfeed was presented as a six minute concert piece. * Zerospace, Dec. 6, 2014. OpenGrounds at University of Virginia. Adapted for interactive video-work, Carbonfeed was presented as a ten minute concert piece. * Hamilton College Studio Arts Opening Ceremony. Oct. 10-11, 2014. Clinton, NY. Installed at the Kennedy Studio Arts Opening Weekend at Hamilton College. * University of Virginia Music Library. Aug. 29 – Sept. 26, 2014. Charlottesville, VA. Initial installation at the University of Virginia. Concurrent audio and visual installations were also housed in the Science, Clemons, and Fine Arts libraries.